I have written a score for performing or recording your own version of the piece (PDF, 29k to download). The cliff hanger I left you with at the end of Part 2, the idea which might not work, was adding voices talking about irrelevant things (I chose recordings of old newscasts), sped up without altering the pitch until they became just about unintelligible – using the same Audacity command as I showed you for slowing down the beats to make drones. All the instruments (apart from the Old News and the Waterphone) are part of my Cork City Gamelan sonic arsenal: Litter Bin, Stainless Steel Gate, Cast Iron Gate, and Rainwater Pipe. Excuse me for dwelling on this point, but it is important to me: The Cork City Gamelan supports and promotes Music Making for People With Disabilities. This piece could have been made entirely by somebody who can barely walk and who does not have the coordination necessary to play conventional instruments. I know it, because I fit this description, and I did it all on my own! And I’ll be performing it live for Sonic Vigil VI at Triskel Christ Church on October 22nd… and I know I can do that, too, because I actually improvised the Waterphone part live. I must admit to editing the pacing, though, in order to maximize the impact of this “studio recording”. My 60th birthday was coming up, and I was going to buy myself a piece of art – something linking me back to the 60s and 70s, when I acquired my taste for the kind of art and music which has been with me throughout my life. A Waterphone seemed to be nice and just about affordable. It is both, a sculpture, as well as a musical instrument. Even if I could not manage to use it for playing music, I reckoned, I’d still own a Thing of Beauty which connects me straight back to then, when… and I could perhaps sample it and compose music with the sounds on my computer. On Richard Waters’ web site, I learned that Evelyn Glennie, one of my favourite percussionists and drummers, actually plays one during her solo recitals. I looked around on the Web for audio or video clips of her playing it, and while I was searching, I discovered something unbelievable about her: that she is profoundly deaf! Eventually, I came across a documentary about her called Touch The Sound – among other things about how her deafness does not stop her from making great music, how it has even helped her to get physically closer to the sound by listening with her whole body. This movie has been an outright epiphany for me. I was not going to allow my disability to stop me making live music any longer. Computers and DAW Software are great, thanks be to Goodness for them… but I really need to play live in order to feel like a whole person. The Waterphone looked like it could be “the ticket”, and I went ahead and asked Richard Waters to make one for me. While was waiting, I made plans as to how I might also use my computer as an instrument for performance in the simplest most basic possible way – after all, I wouldn’t know whether I could handle the Waterphone as an instrument until I was actually holding it in my hands… and that’s how the Cork City Gamelan came into being – that’s why I am posting this piece as a tribute to Evelyn Glennie, the “Patron Saint of The Cork City Gamelan”. Usually, I absolutely do not justify or explain why I do things – why is a sort of a dirty word in my World – but this is different: I want people who believe that they cannot make music to read my story and to be motivated to go out there and do it. After this and Reichtum, there is one more tribute piece of Cork City Gamelan music I feel I must compose – can anybody guess who the recipient might be? 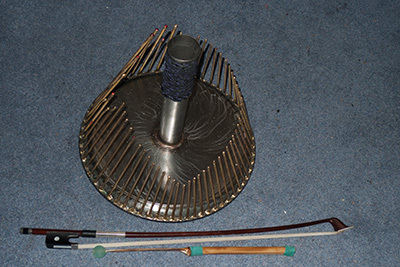 This entry was posted in Articles With Music For Downloading, Music Making for People With Disabilities, Playing The Waterphone. Bookmark the permalink. Great comments. I am a huge fan of Dame Evelyn and have the great fortune of seeing her live twice, in performance with the Toronto Symphony. Why should disabilities impair us? We may not be able to do all that we did before, but that should not stop us from continuing to do something. I listen to her music quite a bit, but I haven’t seen her playing live yet. Next month, though, she’ll be playing a solo recital at the local School of Music 450-seater auditorium, less than ten minutes to walk from my front door… and in December a concert with our National Symphony Orchestra in Dublin. The contrast between the two very different settings should be interesting. I have come to the conclusion that the most disabling of all disabilities is probably the belief that “I can’t do it”. I enjoy the relationship of the voices and other sounds and discovering more of your music.